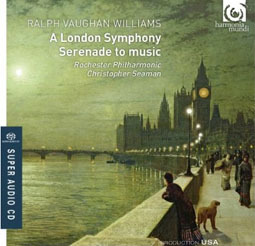 "Harmonia Mundi have chosen an excellent time to record Vaughan Williams' London Symphony with an American Orchestra and presumably for American audiences. ... But it is always apparent that this is an American reading, which given the thoroughly English nature of this music can seem perverse. ... Those big-boned orchestral sounds from US orchestras always play better to home audiences than they do in Europe." This seems like a big issue, deserving of some further thought and commentary. I don't have enough knowledge (or experience) to comment, but I hope some people can jump in.